Here at Slots Guru central we’re not just interested in slot machines to the detriment of everything else; occasionally we feel a little hypnotised by the spinning reels so there’s nothing wrong with a diversion into something a little more chilled out. Bingo is one of those traditional pastimes which never seems to go out of fashion and those who play in the bricks and mortar bingo halls are now joined by those who play online. Software providers such as Electrarcade are one of a number of companies specialising in this area and Six Card Bingo is just one of their offerings. In fact this bingo game is quite similar to Playtech’s Pop Bingo which we recently reviewed in terms of gameplay but the design is refreshingly different. 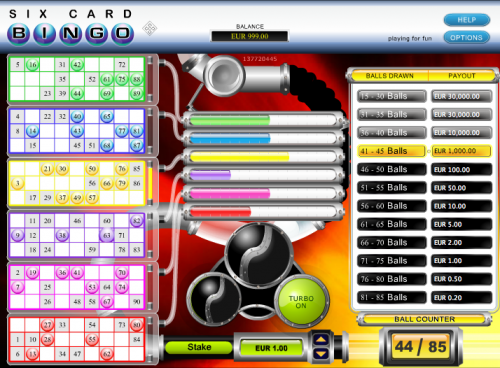 On the left hand side of the screen you will see six coloured bingo cards stacked from top to bottom with a tube from each running to one of six measuring tubes in the centre of the screen. To the right of the tubes are the prize break points with the biggest prizes at the top and the smallest at the bottom. This works as follows – if you can fill up one of your cards within 15 – 30 balls you’ll win the top prize of €30,000; with a minimum stake of €0.20 the smallest prize is €0.04 for using up 81 – 85 balls. It’s worth noting that while the top prize always keeps the same value, the remaining prizes differ depending on your stake. The break even point for your stake is using less than 75 balls. As the player all you need to do is select your stake and press the ‘Play’ button although you are also given the option of swapping the cards for some new ones of you want to and selecting the ‘Turbo’ option for some speeded-up game play. After you’ve pressed ‘Play’ the numbered balls will appear at the top and matching ones will be marked on your cards while the tubes in the middle gradually fill up so you can see which of your cards is nearest to completion. On the right hand side you’ll see the highlighted prize move down the scale as more balls as drawn. If you like bingo then this is well worth a go – just press the button and watch the balls fly!